Please read the following letter regarding the proposed special areas of conservation and special protection areas. This letter is to inform you about progress in the designation of new marine Special Areas of Conservation (SACs) and Special Protection Areas (SPAs). 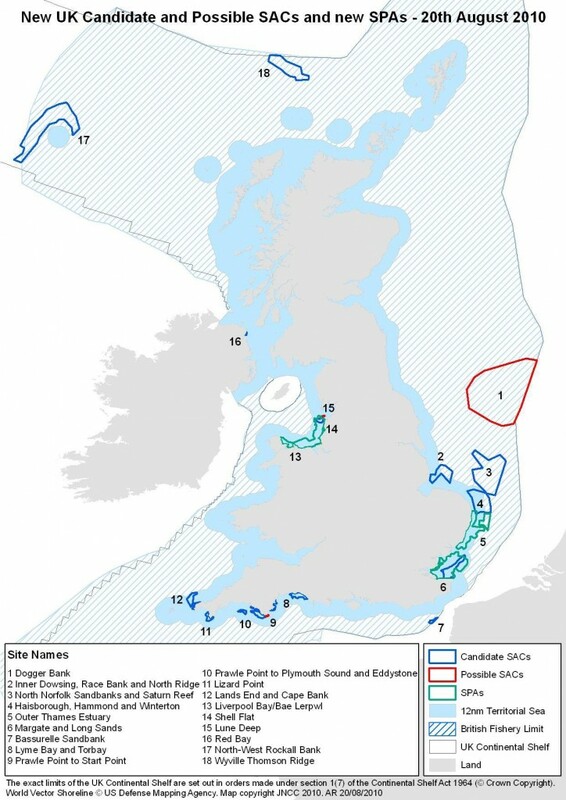 A formal consultation was undertaken by Natural England, the Joint Nature Conservation Committee (JNCC) and the Countryside Council for Wales (CCW), from November 2009 to February 2010, on 10 possible marine Special Areas of Conservation (pSACs) and 2 potential Special Protection Areas (pSPAs) in English, Welsh and offshore waters around the UK. Following this consultation, Natural England and JNCC submitted final recommendations for 10 SACs and 2 SPAs, to Defra for approval in June 2010. In addition JNCC submitted 2 further offshore SACs that were consulted on in 2007-2008; and CCW submitted Liverpool Bay/Bae Lerpwl SPA, which lies partly in Welsh waters, to the Welsh Assembly Government for their approval. Further consultation on two inshore sites and one offshore site was also recommended. Dorset and Devon coast; this site was formerly part of Poole Bay to Lyme Bay pSAC, which has now been split into two sites. Lyme Bay and Torbay has been submitted to the European Commission but the second site, Studland to Portland, is still under consideration and will be consulted on again in due course. Off north-western Scotland; boundary changed as put forward in the addendum which was part of the consultation. Offshore waters off Norfolk; minor boundary changes as a result of the consultation. Off northern Scotland; no boundary changes as a result of the consultation. Inshore and Welsh waters – no boundary changes as a result of the consultation. Liverpool Bay/Bae Lerpwl has been classified by both the Minister for the Environment and Rural Affairs for Defra, and by the Minister for the Environment, Sustainability and Housing (one of the Welsh Ministers) and notified to the European Commission. Evidence has come to light which led Natural England to recommend a new boundary for Lune Deep, which formerly formed part of the Shell Flat and Lune Deep pSAC. Because the boundary changes are significant, Natural England is re-consulting on this site. Lune Deep is recommended for its Annex 1 reef habitat. Evidence came to light during the consultation which led Natural England to conclude that there is Annex 1 reef habitat east of Prawle Point, which could in the future be included in the Prawle Point to Plymouth Sound and Eddystone candidate SAC. As the area of this potential extension is significant it is subject to a further consultation. The Dogger Bank offshore SAC is recommended for its Annex 1 sandbank habitat. Informal discussions on this proposed site were held by JNCC in 2008, and subsequently changes have been made to JNCC’s proposal. This site has not been subject to formal consultation previously. The consultation period for all three sites is from 20th August 2010 (the date of this letter) to 12th November 2010. If you have a national, offshore or local interest in these sites you will receive a separate letter from Natural England or JNCC with information on the consultation, the documents to read and how to respond. Maps, SAC selection assessment documents, SPA departmental briefs, impact assessments, draft conservation objectives, consultation documents and a report of the consultation are all available on http://www.naturalengland.org.uk/ourwork/marine/sacconsultation/default.aspx for inshore sites and http://www.jncc.gov.uk/marineconsult for offshore sites. If you would like feedback on how any response you have made to the consultations so far has been considered, please contact us at Natura2000consultation@naturalengland.org.uk for inshore sites or offshoreconsult@jncc.gov.uk for the offshore sites.